With Rich Guy turning the big 4-0, it was time we got the gang together to celebrate. Due to our busy lives and children, it has become increasingly difficult to just hang out with the guys. However, for the first time in 8 years, we had Costanza, Snake, Vandelay, Rich Guy, Toolman and myself out for a meal. I think the last time, it was Costanza's stag... Ah, the memories... 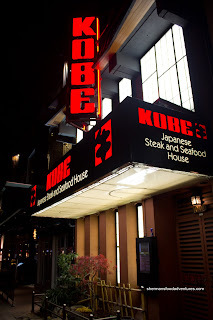 So for such a milestone birthday, it was a bit surprising that Rich Guy would choose Kobe as our eating destination. Kobe??? Isn't that a tourist trap? And furthermore, teppanyaki??? Are we lost in the 70's or something? Maybe he thought we were in Hawaii? Why didn't he suggest Trader Vic's? Oh right, it closed down, much like all the other things that were popular in the 70's. Okay fine, we were going in with an open mind and Entertainment cards in hand. Hey, the place is pricey! We need all the help we could get with the cost. When I walked into the place, Vandelay and Toolman were already enjoying some drinks in the lounge as we waited for everyone else to arrive. The "scenery" was very nice and we really were in no rush to head upstairs. Besides, we weren't allowed to head upstairs until everyone was present since they would begin the meal and "show" immediately. We did eventually make our way up to the teppanyaki stations once Costanza and Snake arrived fashionably-late. Originally, our plan was to each order a different meal. However, when Rich Guy was talked into selection the "Ultimate", everyone else seemed to follow suit. Fine, why not. This way, we could try almost everything that was available on the menu. We started with a Shabu Shabu Soup which was not really all that memorable. Didn't taste like much, but there were big slices of mushrooms though. Our first item from the flattop was the Teppan Shrimp, which already had their tails removed except for 5. These were prepared tableside as part of the "show". With a pat of butter and sprinkle of seasoning, these looked succulent as they sizzled away. And in the end, it appears the sizzling was a bit too much. They were quite nice flavourwise due to the high heat caramelization which accentuated their natural sweetness. However, the texture was missing that "snap". 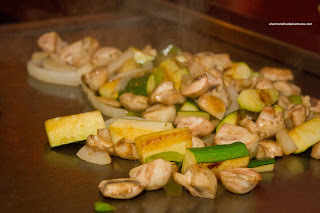 While the shrimp were being prepared, a mix of Veggies including zucchini, mushrooms and onions (from the volcano) were cooked on the side. Since each item had different cooking times, the veggies were placed on the flattop prior to the shrimp. As we were eating the shrimp, the veggies were ready. No complaints here. These were cooked perfectly in high heat so that there was a nice colour. The zucchini retained some texture while the mushrooms were not squishy. 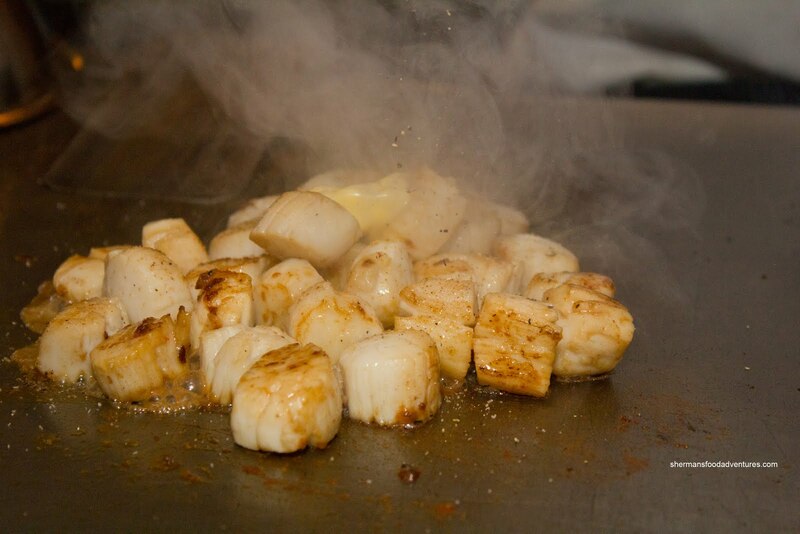 Shortly there after, the Scallops were up. Again, the high heat of the cooking surface immediately added nice colour and caramelization. 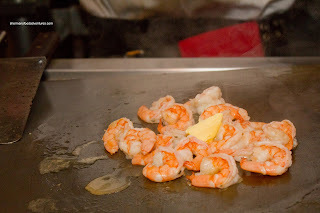 With the same pat of butter and seasoning as the shrimp, there was a similar natural sweet flavour. 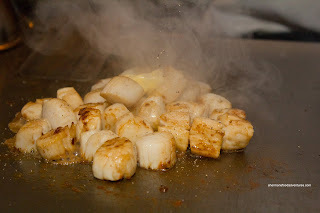 Unlike the shrimp, the scallops were less cooked, hence they were better in that respect. Then, the really good stuff arrived starting with the Lobster tails. 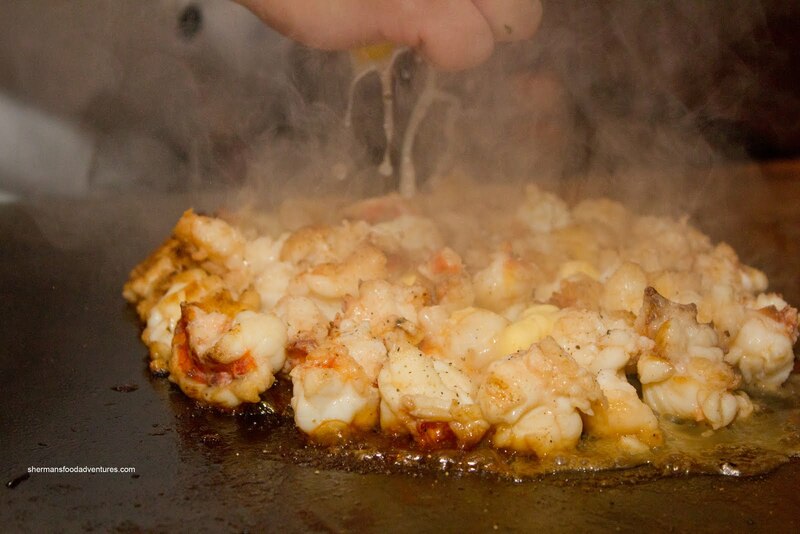 Once again, the lobster was prepared much like the shrimp and the scallops with a squeeze of fresh lemon. And similarly like the shrimp, the lobster was cooked a bit too long for our tastes. I'm not saying it wasn't delightful to eat, but it was a bit tougher than what we would've liked. Such a shame considering this was lobster. Moving along to our first non-seafood meat was the NY Striploin. We each got a strip to ourselves and was cooked to order (well, of course it was...). We all had it medium-rare and the chef did a good job in that respect. Unfortunately, due to the need to cut everything up (so that we didn't need to cut anything ourselves), it kind of ruined the perfectly cooked strip. 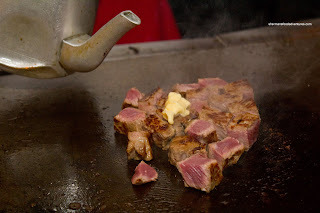 In terms of texture, the steak was pretty tender and flavourful. I've had better, but it was fine for what it was. 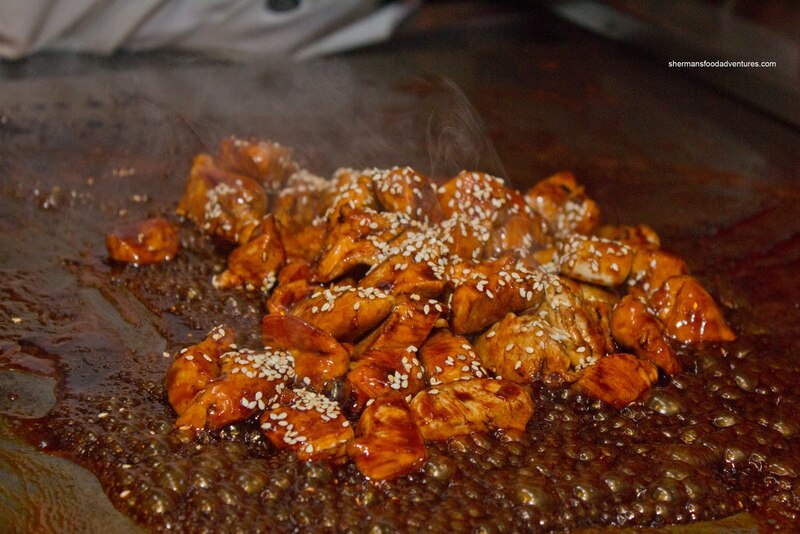 If this wasn't enough food already, there was still the Teriyaki Chicken. Prepared with cubed breast meat and doused with teriyaki sauce as it was cooking, this was a strange item to end the meal with. I guess the climax of the dinner was somewhere between the scallops and lobster. We felt the chicken was slightly overcooked, yet it was okay despite the abundance of sauce. 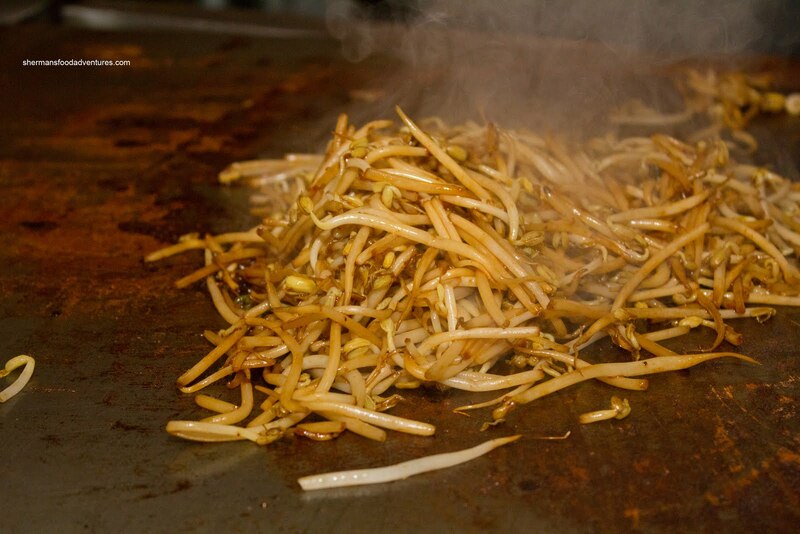 And to "clean" the grill of the residue, we had one more item in the Bean Sprouts. As you can see, the sprouts took on the charred colour of the grill. Don't worry, it didn't taste bad, in fact, there was a nice smokiness to it. Lastly, we had a large slice of honeydew for dessert. All-in-all, the meal was a whole lot better than I had expected. We were extremely full and considering the items we had, the price seemed okay. However, with certain items being overcooked, it did lessen the appeal. With all this being said, it is not cheap to eat at Kobe. Therefore, it really comes down to personal choice as to whether it is worth it or not. Is there such a thing as a GREAT teppanyaki place in the Lower Mainland? Or is Kobe really the only choice? @VC Well to be frank, no. 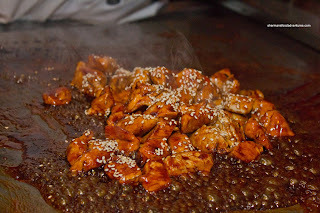 But I am going to visit Gyu Teppanyaki soon and we'll see how that goes.